There are few musicians who are so driven by the music as the bassist Brian Bromberg. Brian has recently released his album Compared To That, an evenhanded mixture of pop and jazz, that will actually excite jazz purists. Now he presents Bromberg Plays Hendrix (2012), a tribute to the late guitar legend Jimi Hendrix. Brian is just accompanied by Vinnie Colaiuta on drums. All other instruments are performed by Bromberg. Bromberg enthuses about his new project: "This project is not a gimmick; it’s very musical and real. It’s all about the music for me." Hendrix's shadow is too big that jazz musician Bromberg could deprive him. One can therefore expect no jazz album. To be clear, Bromberg Plays Hendrix is a pure rock album. As a lover of smooth jazz, one finds, for that reason, on the borders of own taste. Pieces like Fire, Manic Depression and Freedom come powerful and unadulterated. Bromberg uses the hardness of his instrument in order to understand Hendrix's elemental force. Hendrix's psychedelic blues-rock hit The Wind Cries Mary gets a fine frosting by Bromberg. Delicious even for smooth jazz aficionados. A song like All Along The Watchtower shows, however, that Bromberg cannot completely replace Hendrix's voice. On the other hand, he succeeds the instrumental part devilishly well. On Foxey Lady Bromberg faces the audience again with the concentrated power of his slap bass in combination with a wah guitar. Sorry, I forgot, Brian plays only bass. Who knows Jimi Hendrix's version of Hey Joe is able to make friends with Bromberg's presentation. Admittedly a bit soft flushed Bromberg's rendition caresses our ears. Bromberg joins us back to Hendrix's world and reality with Crosstown Traffic, Spanish Castle Magic and Purple Haze. Bromberg himself acknowledges that the work on the album was enormously challenging. 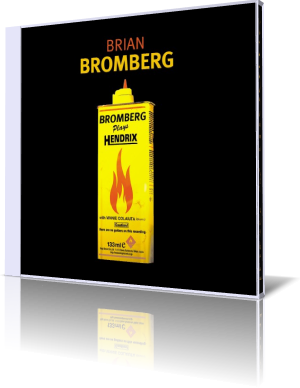 On the instrumental level Bromberg does justice to Hendrix's heritage. However, no one can substitute Jimi's genius. Lovers of bass and Hendrix's music will nonetheless offered an amount of great songs.